When I put up my recipe for Stir-Fried Asparagus with Prawns, some of my favourite readers commented about their preference for Belacan Asparagus instead. Most, if not all, of these readers come from Malaysia / Singapore and belacan (prawn paste) is a hometown favourite. It is rather pungent (or can be offensive) in smell and you either like it or your don’t. 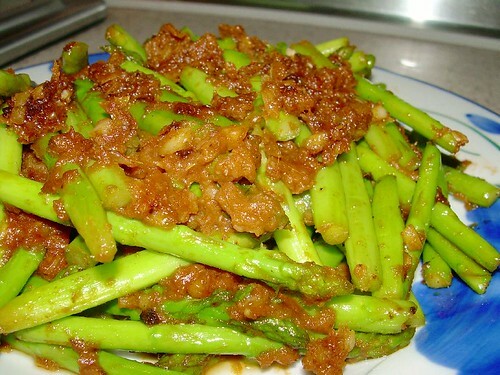 However, I don’t really like the Belacan Asparagus sold in restaurants because I find that most of the time, they use far too much oil and thus render the dish rather unhealthy looking. Cooking for myself, however, is different as I could control the use of oil myself. Pound or blend belacan, pre-soaked dried prawns, garlic, shallots and chilli till it forms a paste. Heat 2 tablespoons oil in wok on medium heat and saute belacan mix till aromatic / light brown. Add some oil if it starts to burn before becoming brown. Note that the belacan mix absorbs oil like tissue paper and therefore, you should try not to use too much oil or your asparagus will be found swimming in oil later. Increase heat to high and add asparagus. Stir well and sprinkle warm water occasionally (you don’t have to use all the water above) to keep it moist and to let the dish cook in a little steam (but not soaking in water). Cook for about 2 minutes. No seasoning is required as the belacan mix is quite salty. You might want to sprinkle some sugar if you find it too salty. Dish out and serve with steaming white rice. Like you, I hate to waste the tail end of the asparagus. I use a vegetable peeler and run it over the end to remove the fibrous outer skin and usually, the inner part of the asparagus is perfectly ready for eating. :O I eat them whole-sale …sometimes it’s really fibrous. But asparagus are expensive, so hate to see them go to waste. Yeah, I also prefer this recipe…you can’t go wrong with it…now where are the big fat succulent udang? Muahahaha. Me and my obsession with Udang. aiyoyoo…. u make me instantly hungry when i saw this picture! the hay bee on top. oooo…..
may : Depending also, most of the local (Malaysian) asparagus are rather thin in size and stringy compared to the ones from Europe or Australia. So, there is quite a lot of waste but it is not overly expensive. One bundle of 200 grammes cost about RM4.00. Considering the nutrients, it is quite reasonably priced. tigerfish : It is perhaps cheaper at the wholesale market 🙂 LOL! me also fan of jamie oliver…watch watch watch all his shows but still haven’t cook anything yet…hehehe real couch potato! great post tq. if you’re afraid of too much oil then it’s better to use olive oil instead. healthy + delicious!! presa1200 : Olive oil may be healthier but it is not suitable due to the taste. It is rarely used in Chinese / Asian cooking.